Built in 1982, by the Tacoma Boatbuilding Company Incorporated of Tacoma, Washington (hull #440) as the Pacific Tractor for the Foss Maritime Company of Seattle, Washington. In 2005, the tug was converted to a TractorPlus class tug. The TractorPlus program was the reconfigurations of existing Voith Cycloidal tractor tugs that were constructed for the Foss Maritime Company. Additional modifications made to the tug included "soft mounting" the new engine to its foundation to reduce structure borne noise. New high grade silencers for the existing main engines, as well as a single engine to drive the new stern drive. Resilient mounting of the entire exhaust systems for each of the three main engines. A sound tight door was installed. Separating the galley from the machinery casing. The existing generator sets were relocated to make space for a Cummins drive engine. And the shaft line was run under an existing hydraulic skid. Power is transmitted from the third engine to the ASD unit through a torsional coupler, and a CENTA carbon fiber shaft. A line shaft bearing was used at the watertight bulkhead between the engine room, and the new ASD compartment. Three Centalink line shaft couplings were used to accommodate the movement of the soft mounted main engine. Her stack was redesigned, following a trademarked Foss design. And was expanded to accommodate the third engine exhaust piping, and to maximize 360 degree visibility on the horizontal plane. 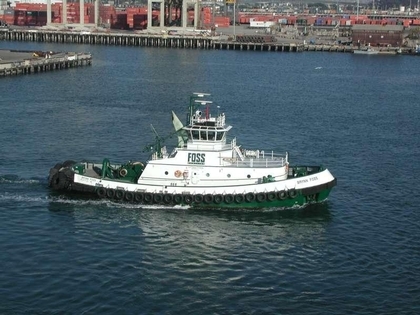 In 2007, the Foss Maritime Company renamed the reconfigured tug as the Brynn Foss. Powered by three, EMD 12-645-E6 diesel engines. With Voith AD 45-FH reduction gears, at a ratio of 15:1. Turning two, five bladed, Voith Cycloidal drives, and a Schottel 1515, variable pitch, z-drive. For a rated 4,700 horsepower. Her electrical service is provided by two, 75kW generator sets. Driven by two, Detroit Diesel 6-71 diesel engines. The tug's capacities are 35,000 gallons of fuel, 1,695 gallons of hydraulic oil, 2,450 gallons of lube oil, and 5,000 gallons of water. The towing equipment consists of INTERcon HSW-40 winch, with bow capstan, mounted on her bow. Outfitted with, 200(ft) of 8(in) RP12 wire. And an INTERcon SD-200, single drum towing winch, with a capstan. Outfitted with 200(in) of 10(in) RP 12 line.